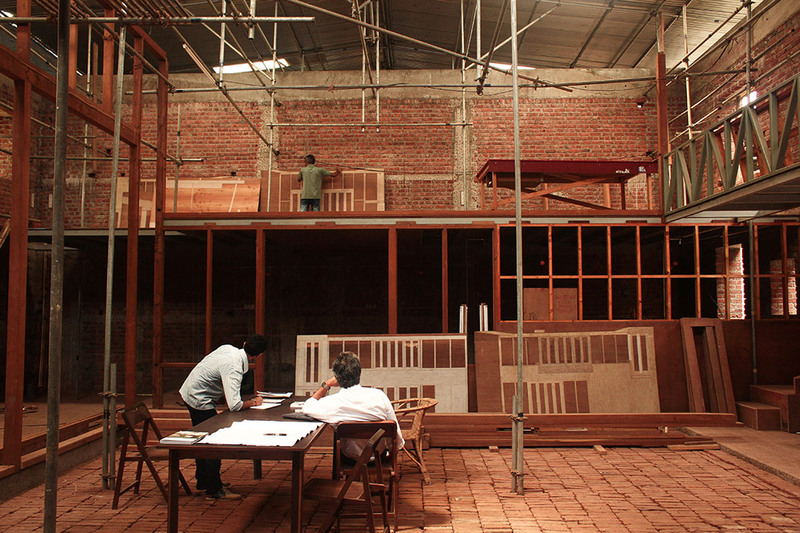 “Studio Mumbai” is a team of architects and craftsmen who together engage in designing, researching, and building, an operation comprising around 100 people, including stonemasons, carpenters, weavers, and architects, in which knowledge and experience of Indian craftsmanship and contemporary architecture come together. Traditional woodworking takes place here just as much as design work on laptops. 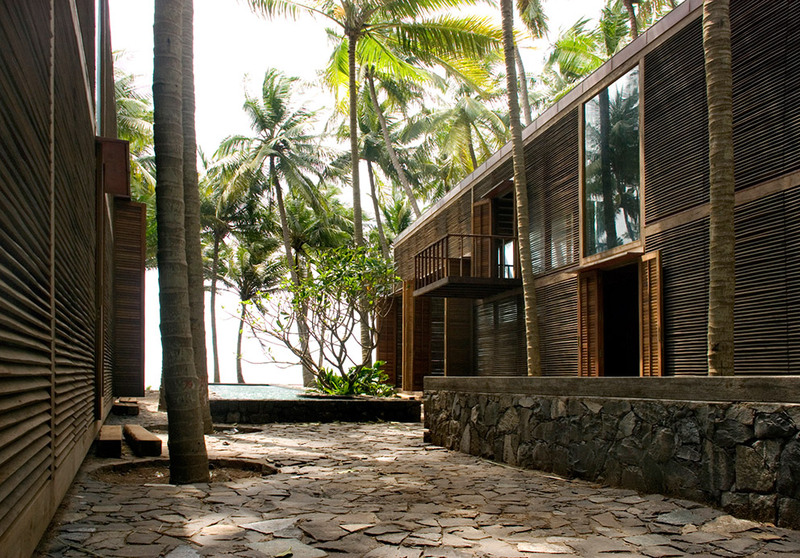 The Studio Mumbai offices and workshops are located in Alibag, 30 kilometers from Mumbai. Here, not far from one of the world’s most densely populated areas and urban conurbations, the calm atmosphere seems to favor concentrated working. 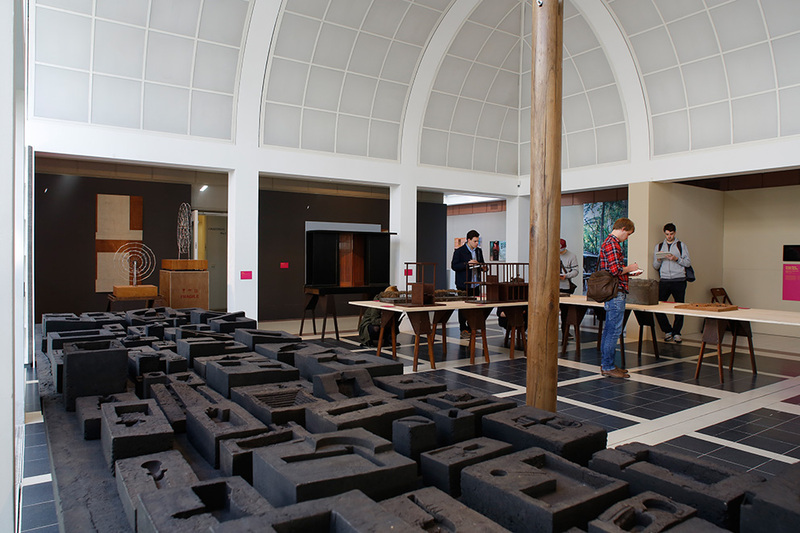 In the exhibition “Between the Sun and the Moon – Studio Mumbai”, Deutsches Architekturmuseum (DAM) in Frankfurt/Main is currently showing works by the Indian collective. On the ground floor, where the exhibition is being staged, there are two distinct sections: In a wrap-around walkway visitors encounter videos and screen presentations of individual projects, as well as photographs and accompanying texts. In the middle, numerous models made of various materials are clearly laid out on tables, while color pigments, fragments of colored tiles and material samples are well arranged on shelves. As such visitors reverently circle the impressive exhibits, large and small, and get an in-depth impression of the Studio Mumbai archive. They come across handmade bricks for hollow block walls and negative forms made of tar for copper roof parts. All this makes for an interesting ensemble of shapes and atmospheric images. All the places where the edifices were built are presented by means of a model of the surroundings. Every timber joint, no matter how small, comes into its own in detail. Whatever you look at, you can see the care that went into the deliberations about the design and the particular value the studio attaches to the materials and the environment. 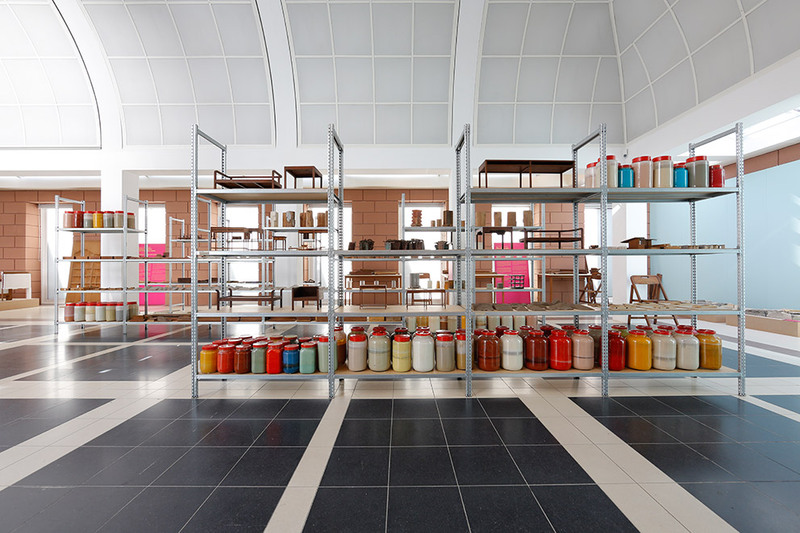 The Studio Mumbai archive: In the exhibition the myriad models, color pigments, fragments of colored tiles and material samples are displayed well arranged on shelves. With its rapidly growing economy, India is currently undergoing enormous restructuring. In many places urban planners and architects have to build quickly and cost-effectively. As a result the architecture that emerges often has little interest in local climatic conditions and the country’s ancient cultural traditions, and is geared primarily to forecasts of economic growth and rising population figures. In India too, glass and aluminum façades and the universal formal idiom of major international corporations account for a large part of construction activity. This is where Studio Mumbai comes in. 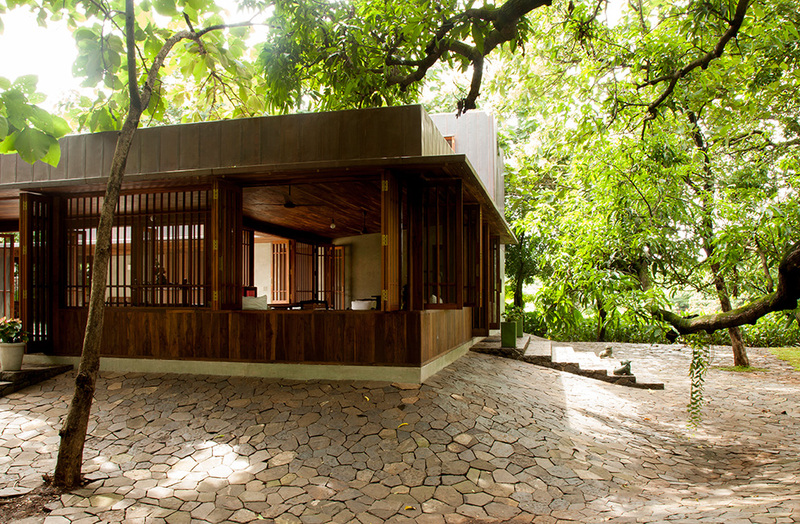 It attempts to evade the ubiquitous acceleration and to anti-cyclically produce architecture that is aligned to the rhythms of nature and the needs of India’s people. The search for a way to express the country’s manifold ancient cultures takes the place of interchangeable global edifices. 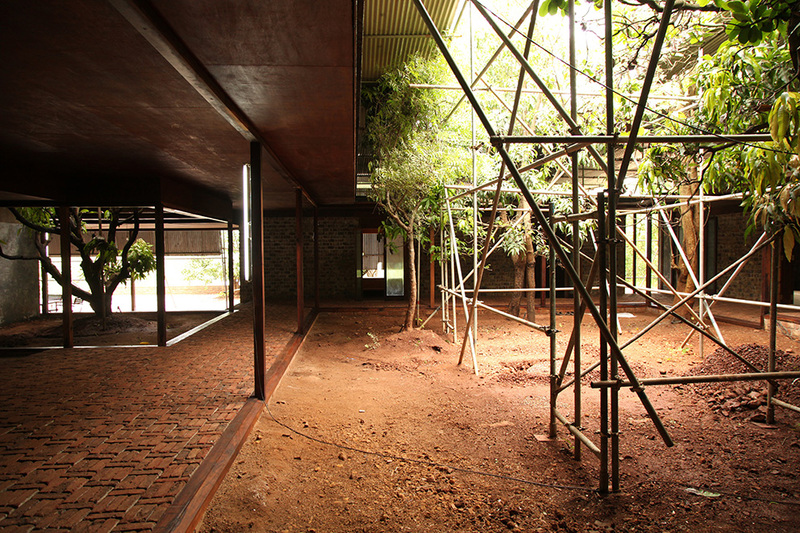 In the process the studio always make a fresh attempt to reconcile India’s climatic conditions, which are marked by heavy monsoon rains, great heat and high humidity, with current social and economic requirements and come up with sensitive contemporary architecture. Other studios also make reference to localities and traditions. In the case of Studio Mumbai’s projects, however, this is intensified still further. Its research processes attempt particularly far-reaching investigations of the locality: Ideas take shape not only on paper and computers, but using life-size models they are tested in the studio or on the plot of land that is to be built on, under real-life conditions, as it were. Correspondingly, the design stage and construction process are closely linked, with the classic division between planning and realization being done away with. Turning his back as he does on the conventional way an architect works, Bijoy Jain, the founder of Studio Mumbai, seeks to develop a new architectural language in which the achievements and advantages of Indian building traditions are respected so they can be integrated in contemporary architecture and advanced under present-day conditions. What emerges this way is nothing less than a symbiosis of design principles influenced by Western Modernism and characteristics of traditional Indian craftsmanship. For this reason the exhibition also focuses on the large detailed models, the molds for prototypes and the characteristic material samples of fired brick, as well as timber and stone, which Studio Mumbai makes itself for each of its structures. 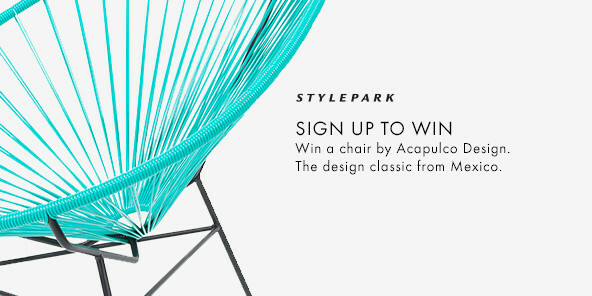 It is primarily this way of working that distinguishes the studio from traditional architecture firms. Far away from where the edifices were actually built, the models in the exhibition first and foremost document Studio Mumbai’s work process and the architecture it produces. Furthermore, in the context of the exhibition originally conceived by “arc en rêve centre d’architecture Bordeaux”, they seem in terms of style to be an ensemble of impressive objects. It is as if large parts of the studio have temporarily relocated to the museum so as to be able to demonstrate the collective’s creative processes and its sensitive handling of materials as India’s valuable resources.